We love hosting parties here at our home for family and friends, and often times we serve up some delicious tasting cocktails to our party guests. 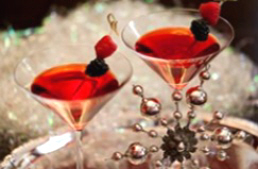 We love berries and this Black Raspberry Cocktail recipe from the great folks over at Sparkling ICE is one of our favorite cocktail drinks this year! It is really easy-to-prepare! Combine all ingredients into a shaker with ICE. Shake and pour into s chilled martini glass. Garnish with fresh blackberries or raspberries (optional).